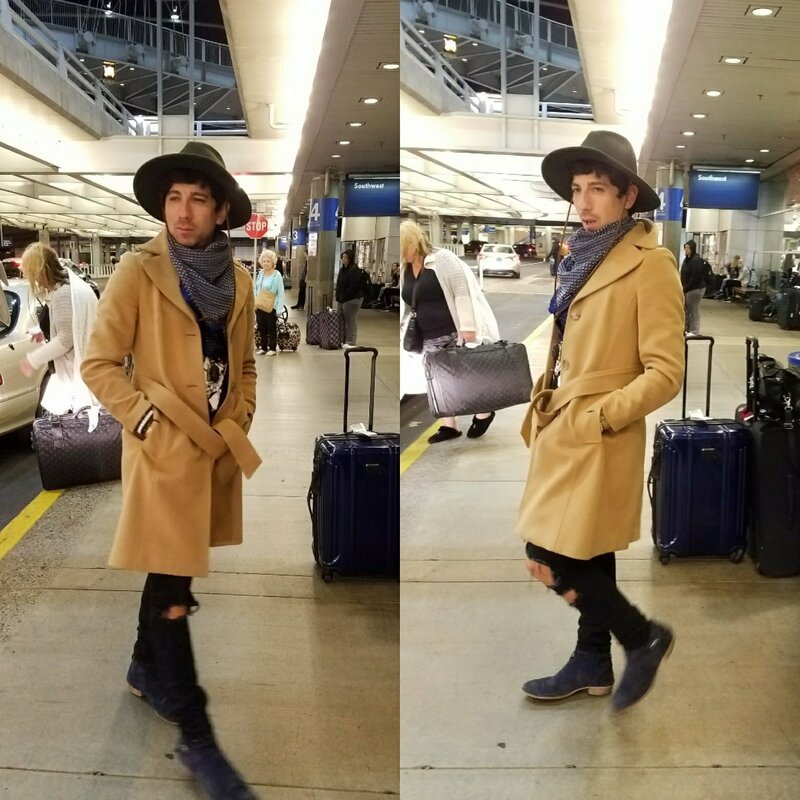 Airport fashion. It’s a thing. | O.K. look, here's the deal. O.K. look, here's the deal. this is what I think about. food. fashion. travel. fun. ← Leopard print – it’s my thing. Airport fashion. It’s a thing. The fabulous Anthony Leroux. A terrific stylist based in Phoenix, I met Anthony while returning home from a visit with my folks. He caught my eye because my son, and then my daughter, had both bought thrifted wool, camel-colored coats in the last couple of weeks. Are the young and hip embracing the camel coat right now? Good for them. It’s a timeless classic and I love to see the different ways they’re styling it. “Can I take your picture for my blog?” I asked him. “I love your coat!” It took me five minutes to get up the nerve to ask. And it was my very first ask ever. For sure it won’t be my last. Anthony’s friend, fashion stylist, Danni Ordonez, based right here in Portland, Oregon, was picking him up. And so I happily met Anthony and Danni and made two new friends! Fashion blogging – bringing us all together. Click on the link above and check out Anthony’s work. Seriously high style. You can also follow him on Instagram @aconsciousaesthetic. A note to readers: There are affiliate links in this post. If you click on these links and make purchases, I will be paid a small commission. I only promote or recommend what I sincerely adore. Thank you for reading! I am a wife and mother. I am an Orthodox Christian. I am a Syrian American with family living in Syria. I am a also a yoga teacher and freelance writer. I recently described myself in a job pitch as "a person who's lived in Portland, Oregon for over 20 years with a passion for writing and a passion for all things Portland. I'm a foodie, knitter, wine and beer lover, bee-keeper (yep, I said it), mead and fruit-liqueur maker, organic gardener, home-canner, hiker, biker, runner, and occasional skinny-dipper. I’ve camped all over the state, I sail a sailboat that’s moored on the Columbia (o.k., I'm the first mate), and I spend a large percentage of my time at our beach house in Seaside." That about sums it up. This entry was posted in Fashion, stuff I like/stuff I don't like and tagged airportfashion, airportstyle, fashionforthepeople, Nakid. Bookmark the permalink. Check out my social media…. World Traveling Soulmates. Finding ways to explore the world one magical place at a time.